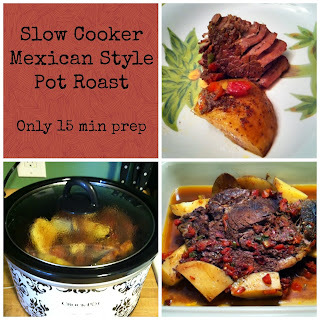 Brett's favorite meal is my Mexican Style Pot Roast. It's really easy to make and I've posted it before. However, in my quest to make my family eat less processed foods I had to update the recipe with fresh ingredients. I think it tastes much better with more fresh ingredients so I don't think I'll ever go back to the canned method. Plus it's actually cheaper to make with fresh ingredients. Those canned potatoes are expensive compared to fresh ones! 1. Mix the seasonings in a small bowl. Season all sides of the pot roast with the seasonings leaving some for the potatoes. 2. Optional-sear the pot roast over med-high heat in a large skillet. I skip this step when I'm in a hurry, but it adds so much flavor! 3. Place the pot roast in a 4.5 quart Crock Pot. Pour the Rotel over the roast. 4. Add the potatoes to the Crock Pot and sprinkle with the remaining seasonings. 5. Turn on low and cook for 5-6 hours. So there it is, the easiest and tastiest pot roast recipe I've ever made. The old recipe took me 5 minutes to assemble and this way took 15 minutes. I think it's worth the extra 10 minutes. It is the prefect meal for a busy and cold fall or winter night. This looks so tasty! I can't wait to try it out on one of these cold New England nights soon!